If you press Cmd+Enter on iTerm while having the preference "Use native fullscreen windows" turned off, it goes into fullscreen but not the standard MacOS-way. Is there a way of doing the same in Terminal.app? I know I can use Ctrl+Cmd+F to enter a native full screen. And I know I can maximize the window manually to eventually consume all of the screen, but in this case the title is still visible. No, there's no support for this in Terminal.app. Double-click the title bar of the window. Double-clicking the window again will return it to the previous size and position. 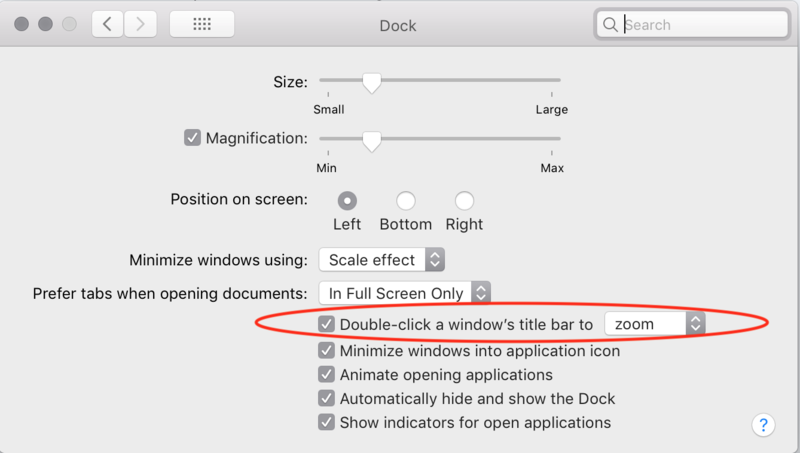 Note: Make sure that "Double-click a window's title bar to zoom" is set under System Preferences -> Dock. Add a system-wide keyboard shortcut. for the Zoom action. Not the answer you're looking for? Browse other questions tagged terminal iterm fullscreen . Is there a fullscreen Terminal app that is faster than iTerm? Is there a keyboard shortcut to jump directly to a particular full screen app in Lion? Why does Safari OS X no longer open full screen, and why won't the little green circle make my window full screen? Is there a way to flip the functionality of the green full screen / maximize button?